Rarely found anywhere else, private ski clubs are an anomaly to Ontario. Nowhere else in the world have so many private ski clubs thrived like they have on this tiny section of the Niagara Escarpment. Roll back the clock to a cold weekend in January 1948. The place is Mont Tremblant, Canada’s premier ski area at the time. Two young couples, Bill and Allison Kingsmill and Struan and Barbara Robertson, are inching forward in a line-up, shivering in the cold, waiting for the pre-war lift to drag them to the top. The war – World War Two, that is – has been over for almost three years and skiing is a booming sport. For Bill, Allison, Struan and Barbara, the future looks pretty clear: longer lift lines and more congested hills, not just here, but everywhere. Wouldn’t it be great, they think, if they had their very own hill, where they could ski with their friends in relaxed, uncrowded conditions? And so, a new idea was born: the private ski club. Today, there are four of them along the Blue Mountain ridge, where they coexist with a very different kind of ski facility: Blue Mountain Resort, a private company founded in the 1940s by the legendary Jozo Weider and open to the public at highly competitive rates. (Two more private areas, Devil’s Glen and Beaver Valley, are not far away.) With very few exceptions, there is nothing like these clubs anywhere else in the world. So why did they develop here and not in the US, or in Europe, or for that matter, in the rest of Canada? The standard answer is: scarcity of terrain. The best skiing and boarding areas in Ontario within reach of Toronto are found on the Niagara Escarpment. That explains why there are so many different snow sport operations in this area. But it doesn’t explain why so many of them are private. For the answer to that, you have to go back in time. Bill Kingsmill and Struan Robertson wasted no time following up on their dream. That spring, after careful research, they found a suitable piece of property for sale on the south end of the Blue Mountain ridge and then, with some skilful salesmanship and arm-twisting, persuaded 30 people to pony up $100 each to buy 50 acres of hillside. They were officially incorporated in September 1949 as the Osler Bluff Ski Club, named after the limestone promontory that looms over the property. There were no precedents for what they were doing, so Osler had to fly by the seat of its pants. Growth was slow at first, and club members did much of the hard labour themselves, cutting trails through the bush, erecting a base lodge, building chalets. They constructed a reciprocal lift that used an old Chrysler engine and a steel cable to pull two wagons holding 32 skiers at a time up the hill. They organized skiing and racing instruction for their members. And above all, they had fun together on and off the hill, with dances, dinners, and plenty of après ski parties. By the time the next two clubs appeared on the ridge – Craigleith and Alpine Ski Club – Osler was established enough to serve as a model. Like Osler, the newer clubs bought their properties from local landowners and financed the purchases with debentures and secured bank loans. Like Osler, they went through a boot-strap phase, clearing the trails, building their facilities, and pretty much managing the property themselves. Like Osler, they developed a rich, communal life that helped to sustain them through hard times. But there were differences, too. The driving force behind Craigleith, founded in 1958, was a young man called Doug Bowie who built the club from scratch. 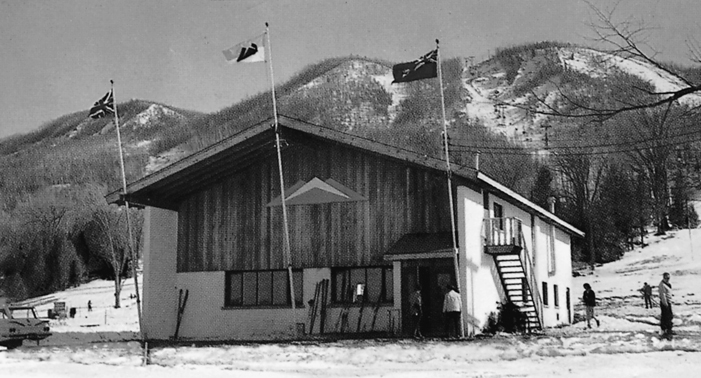 Alpine, by contrast – well before they bought their property near Arrowhead Road in 1960 – had already existed for three years as a Toronto-based travelling ski club. Compared to its sister clubs, Alpine’s move into private ownership was taken reluctantly, almost a last resort, so to speak. Many of Alpine’s early members had emigrated from Europe, where the idea of turning the best skiing areas into private preserves was practically unthinkable. Before making the final decision to buy land, Alpine’s president, Hans Kent, sent a letter to the Ontario government urging it to develop public ski areas in the province. But as the Globe and Mail reported at the time, Alpine was politely rebuffed. The government had no interest in getting involved in the sport, so Alpiners voted to pursue the private option. One thing that makes these Blue Mountain ridge clubs unique is that although they are, strictly speaking, private clubs, they are in fact collectively owned and run by the membership. This makes them a very different animal from the real-estate based private clubs now springing up like base camps around luxury ski-areas in the US, where members pay astronomical initiation fees to buy into a ready-made commercially run operation. By contrast, members built the Ontario clubs themselves from the ground up over half a century, and this has fostered a multi-generational family atmosphere with a lively social life bound together by shared traditions and life-long friendships. The value of the real estate they own is just one part of the clubs’ assets, but because of how the clubs are run, it’s inseparable from the other, less tangible values. The history of Georgian Peaks is a good illustration of what can happen when you try to run the commercial and social aspects of a ski club as separate entities. 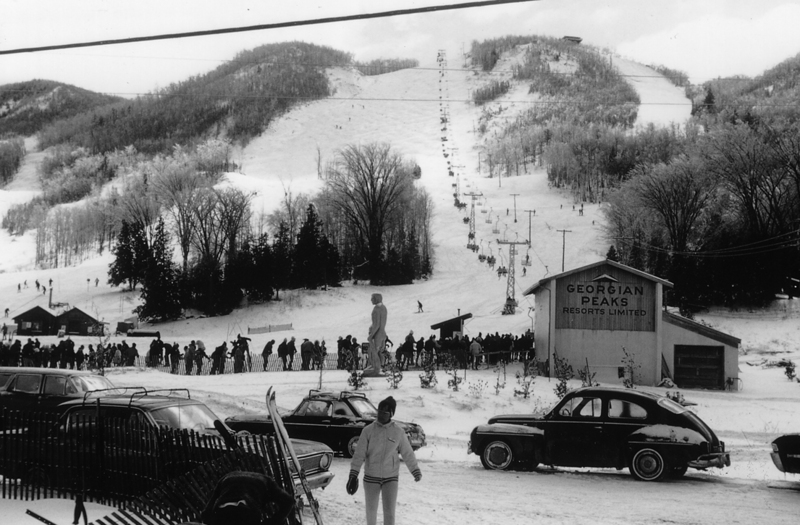 In 1957, an entrepreneur called Ian “Buck” Rogers began to explore the feasibility of buying a tract of land for a commercial ski area to be called Georgian Peaks Resort. Working with a partner, Ross Wilson, he put together a group of backers and set about acquiring the property. Rogers soon realized that to make it work he’d need a different kind of investor, one more interested in skiing than turning a profit. So he proposed a private club that would operate almost as a parallel entity within the resort. Thus Georgian Peaks, the club, was born. For a while, this dual model seemed to work. The company and the club had enough combined clout to install pioneering snowmaking facilities, build the first chairlift in the area, and bring in a number of international racing events. But by the early ‘70s, cracks were beginning to show and the Peaks spent the next decade trying to decide if it was a club or a business. In 1981, Blue Mountain Resort bought the company and took over the operation while allowing the club to run its own affairs, more or less. But club members grew disgruntled with the arrangement and eventually, in 1987, the club bought the Peaks outright and since then has run it entirely as a private club. 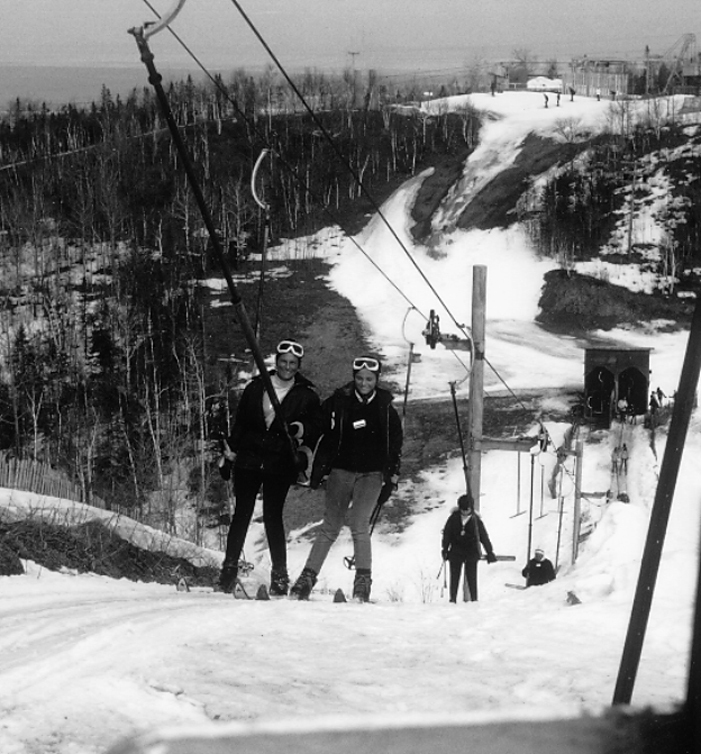 When the clubs along the Blue Mountain ridge were putting down roots in the 1950s, the Ontario government expressed no interest in developing public skiing areas. This – and the fact that ski terrain was already privately owned and up for sale – enabled the clubs to step in and fill a vacuum. By the 1970s, however, the government was having second thoughts and tried to get back into the game. They commissioned a study of the private clubs to see what made them tick. The study’s conclusion was oddly remote from the reality: the clubs existed, it said, because their economic model – high membership fees combined with low management costs – allowed them to survive during hard times. On that basis, the government proposed to get involved by offering to subsidize their operations – a proposal the clubs rejected. The government had apparently failed to grasp that the real reason the private clubs were able to survive hard times was not economic; it was social. The clubs were cohesive in a way a strictly commercial operation could never be. With no more available real estate on the ridge, the clubs have expanded physically about as far as they can, but that doesn’t mean they’re not still evolving. With rising costs, the price of new memberships, once relatively modest, has become affordable only to those in higher income brackets – an elite, if you like. So the demographics are changing, and that often causes friction – sometimes euphemistically referred to as “heritage issues” – among the membership, which by now includes the great-grandchildren of original members. But it’s that same intergenerational depth and cohesion that gives these clubs the inner strength to survive. Where that evolution will lead is impossible to say, but for now, it’s a safe bet that these unique institutions will be around for a long time to come. Oakley Progression Sessions: The Best Women’s Snow Camp Ever?